Eurocom (www.eurocom.com), has officially added support for RedHat Enterprise Server Edition 6.4 in its EUROCOM Panther 5SE Mobile Server solution for onsite, server deployment wherever needed. “Eurocom is excited to offer an all in one Mobile Server enterprise solution in a Notebook Form Factor able to run RedHat Enterprise Server Edition 6.4, with no server room required. The Panther 5SE is a portable, mobile and scalable enterprise technology, designed specifically for fast growing and dynamic organizations that do not have or do not require a permanent IT infrastructure” EUROCOM President, Mark Bialic. Eurocom’s Panther 5SE now supports Windows Server 2012, Windows Server 2008 R2 x64, VMware ESXi and RedHat Enterprise Server Edition 6.4. Mobile Server systems are every bit as adept at running virtualized environments as their rack mount counterparts. “The EUROCOM Panther 5SE mobile server does not require expensive server rooms and permanent IT infrastructure, it can be up and running within minutes to provide server capability anywhere, in the blink of an eye. Perfect for companies on the move” Mark Bialic. Space. EUROCOM Panther 5SE solutions allow considerable multi-server capability in spaces too small for even a single rack. Ultimately, the EUROCOM Panther 5SE Mobile Server creates new opportunities for the entire industry. When servers can go everywhere and run cutting edge applications with top performance, there are countless opportunities for new sales, a leap in customer service, and the ability to reshape enterprises so they can master tomorrow’s unpredictable demands. • A racked system still requires a keyboard, mouse, and monitor, which are often placed on additional trays within the rack in order to minimize the total hardware footprint. With Mobile Server, these peripherals are integrated. • Conventional servers require attendant UPS capability rated for at least 10 to 15 minutes of runtime before shutdown. 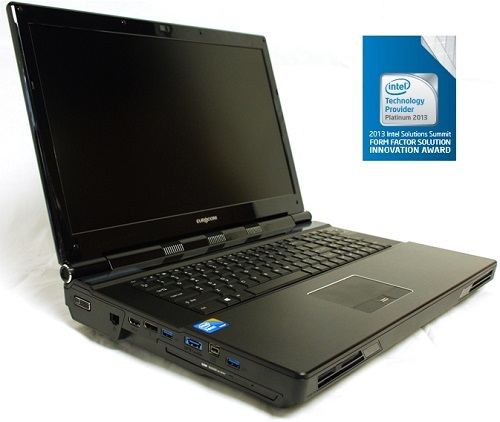 With the EUROCOM Panther Mobile Server, the swappable polymer Li-Ion battery provides many times this amount. • Whereas traditional servers typically require 800W to 1000W, Mobile Server systems will run a full load at under 250W. Also consider how much less ambient cooling will be needed as a result of such power drops. • If a unit needs to be swapped out for any reason, simply grab and go. Most of the wiring required in rack mount scenarios vanishes with a Mobile Server. • Obviously, taking a racked server to a customer’s site is problematic, and even tower-style servers are considerably more cumbersome. A Mobile Server solution simply slips into a notebook carrying case.